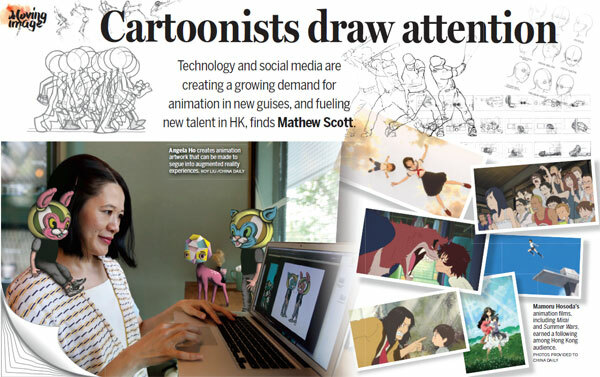 Technology and social media are creating a growing demand for animation in new guises, and fueling new talent in HK, finds Mathew Scott. Neco Lo Chi-ying has spent more than three decades working in Hong Kong's animation industry, watching it evolve. It's been a slow process, says Lo, secretary general of Hong Kong Animation and Comic Association. The constraints of the local market have restricted cinematic output of both the feature-length and short-length varieties, he adds. However, the growing diversity in the demand for animators and illustrators fills Lo with hope. "We are a small market but there are still some large projects underway - this is positive," says Lo. "There is a lot of creativity in Hong Kong. We are seeing students start their own businesses, and using their creative skills for corporate animation, branding, or even computer games." It's a path being followed by Hong Kong-based illustrator Angela Ho (Instagram:@ahoyillustration) who won awards for her animation work at Australia's Triple J Framebreaks Short FilmFestival in 2003 and at the New York International Independent Film and Video Festival in 2004. These days Ho divides her passion for illustrating between commercial work and more personal projects that include exploring advances in augmented reality. "I work in various illustration styles, do basic animation and graphic design for corporate clients. It pays my rent and bills," says Ho. "Because of social media there's a demand for short animated content from clients. This work buys me time to make the artwork I really want to make - the work under the Ahoy Illustration banner." "If I was only to do commercial work to a brief I wouldn't be happy creatively," Ho adds. "Making art keeps me sane." Ho's work is evidence of how far such creative work can take an artist, as she prepares to take part in the likes of the Small Wall Project in Melbourne in May 2019 (https://www.outregallery.com/). "I get to satisfy my need to make my artwork move with augmented reality due to the way I use it - they're like short little moving surprises behind my artwork, like the toy in a Kinder Surprise, I hope," says Ho. "And it's less time-consuming than creating a full-blown animation with a complete narrative. Making short looping animations is also perfect for an Instagram attention span. " While Chinese-language animation dates back to the release of Princess Iron Fan (1941), the Hong Kong film industry was rather late in joining the party, especially considering it produced an incredible number of films in the post-war years. In the 1990s more than 400 productions were being released a year. 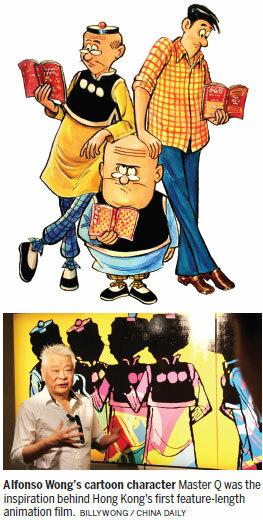 The first feature-length Hong Kong animation was Old Master Q in 1981 - based on Alfonso Wong's ageless character Master Q. Filmmaker Tsui Hark dabbled in the genre in the epic A Chinese Ghost Story in 1997. But it wasn't until the release of My Life as McDull in 2001 that Hong Kong had an animated franchise of its own. Six more McDull films from Alice Mak's Bliss Pictures - the last being McDull: Rise of the Rice Cooker (2016) - and that nearly sums up the animated features produced in Hong Kong so far. Mostly this is down to pure economics of both the time and cash variety. The first McDull production took four years to be realized. Last year box-office takings for McDull dropped for the second year running - down five percent to $237 million. It's little wonder big studios are wary of backing large-scale animation projects and that Hong Kong talent has mostly sought out larger markets to find work. An example is the animator and filmmaker Raman Hui, who worked on Dreamworks' Shrek series before taking the reins completely for the mainland-backed Monster Hunt films - also huge box-office hits. For their own animation fix, Hong Kong audiences have mostly turned to Japan's famed Studio Ghibli, led by Hayao Miyazaki who created the Oscar-winning Spirited Away (2001). The film was a hit in Hong Kong. As the 77-year-old Miyazaki winds down into retirement, filmmakers like Makoto Shinkai (Your Name) and Mamoru Hosoda (The Girl Who Leapt Through Time) - featured in Hong Kong Cine Fan Summer International Film Festival - seem ready to succeed him. "You saw animation enter martial arts movies in the 1960s, but full-length animated films have only a small role in Hong Kong cinema history," says Hong Kong International Film Festival Society Programme Manager Alvin Tse, who has worked on the Hosoda line-up. "Hong Kong audiences have looked to Japan because the market needed to support such productions just isn't (here). That makes it hard for artists to make these films in Hong Kong." Meanwhile, the Hong Kong Arts Centre-backed Comix Home Base in Wan Chai was established in 2013 to help promote and support local artists - about the same time as the Open University of Hong Kong started its four-year animation course. "Now there are more than 80 graduates coming through each year; before there were only around 10 in total, graduating from other courses in Hong Kong," says Lo. "So this is exciting as we see this new generation come through and we get to see what they can create."